This latest Micro Engraver from Wecheer is a tremendous improvement over their original and under-powered blue model. It operates from an adapter (included) which converts your 110V system to DC 18V. 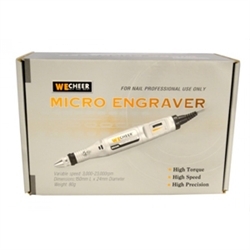 Just keep in mind folks that this is a Micro Engraver and not a tool for hogging away waste stock. Nor is it meat for constant use and to replace a standard Micro Motor. This is a relatively inexpensive tool for occasional work. It weighs only 80grams (4oz) and designed for texturing and detailing. If used properly will give you years of trouble free service.